The age-old game of chess is going through a transformation, and in a very ‘connected’ way. 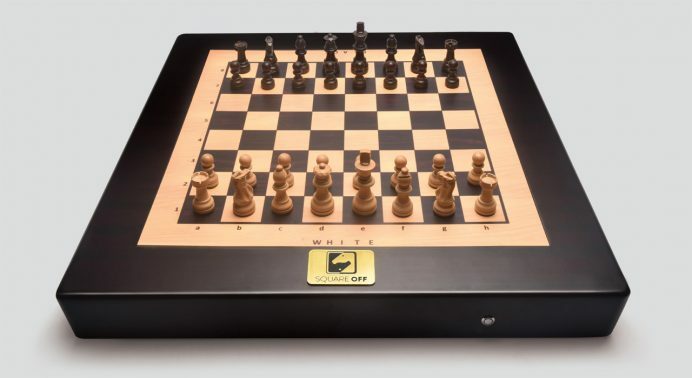 The brainchild of India-based Infivention, Square Off is a smart, connected, and digital chess board set that moves pieces across the board automatically as per digital players’ moves. The traditional looking wooden digital board has pieces fitted with a camouflaged robotic arm. In addition, the set is also fitted with magnets that together with the robotic arm move the pieces smoothly without clashing with the others. Square Off makes it possible for users to play chess with other chess enthusiasts, without the need for the person to be physically present, without even the need to share the same chess board. The available playing modes are Square Off, Training, and Live streaming modes. On the automated chess board, users may play via a Bluetooth-connected app with an online opponent anywhere in the world (precise moves will be represented in the opponent’s automated board game), or against a digital artificial intelligence program. The Square Off App – Android and iOS compatible – will be available eventually. Currently, only beta versions of the App are available. The App facilitates easy game access and seamless interaction between users and the board. The idea behind the App is to keep the board free from buttons, allowing users to get the classic chess board feel. Users can also receive game instructions through the app on their phone screens. Slated for a Spring 2017 official launch, at the moment, Square Off is crowd funding on Kickstarter. Early bird sets can be bought for € 179.